One of Finland's leading composers of today, Kalevi Aho was born in Forssa in southern Finland on March 9, 1949. He studied at the Sibelius Academy in Helsinki under Einojuhani Rautavaara and in West Berlin in Boris Blacher's composition class. In the years 1974-1988 he was a lecturer in musicology at Helsinki University; from 1988 until 1993 he was Professor of Composition at the Sibelius Academy and since the autumn of 1993 he has been a freelance composer. 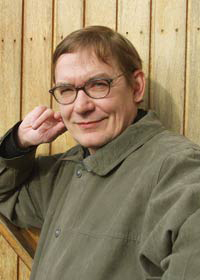 Kalevi Aho is one of the finest of the "new romantic" composers of the post-war generation, and his compositions combine the best of both traditional and modern musical forms and structures. He is a particularly brilliant and colourful writer for full orchestra, and many of his works for symphony orchestra, whether concertos or not, contain brilliant solo passages for individual players.